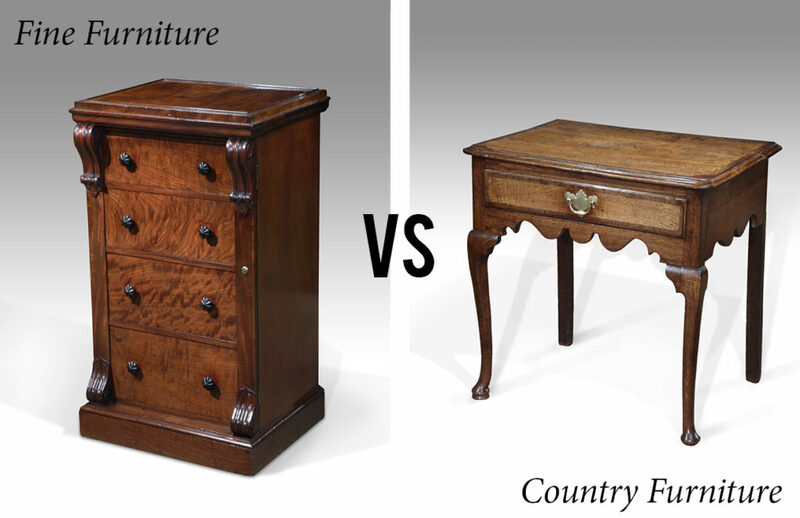 One of the questions we are frequently asked is: what exactly is “country” furniture – what does the term mean? Strictly speaking, it refers to furniture made by country craftsmen, varying from purely functional pieces made by amateurs to expertly constructed and carved work based on the fine furniture made for the rich. Much country furniture is naive, with the best of such examples falling into the category of folk art. The furniture is simple and sturdy, rarely delicate in design or workmanship – sophisticated decoration such as marquetry or gilding is not found on this type of furniture. Whilst some country pieces were for purely functional purposes, others were made by skilled country craftsmen to emulate the fine furniture produced by the top cabinet makers of the day such as Chippendale or Hepplewhite. Local timbers were used instead of exotic, imported mahogany and expensive satinwood or rosewood. Walnut continued to be popular throughout the 18th century, although it was very out of fashion other than for country pieces – prized for its figure and colour, although very susceptible to woodworm! Oak was perhaps the most commonly used timber for country furniture – solid, stable, hard wearing and beautiful, particularly when ‘quarter cut’ to display its distinctive medullary rays. Another very popular choice was fruitwood – predominantly cherry, although both apple and pearwood were also used. Cherry had the advantage of being cheap, readily available, and easy to work, with a fine, close grain. It also has a lovely warm colour to it, and, when patinated with age, bears more than a passing resemblance to mahogany. Country furniture bore many of the same characteristics for centuries, for styles changed slowly and lingered long after they had been dropped in fashionable furniture. The Windsor chair is one of the best-known examples of country furniture, and incorporated a mix of woods. Elm was often used for the seats, as its wild, interlocking grain is strong, while ash or yew were easy to steam bend to make the hooped backs.